You'll take her breath away with this astonishing arrangement. 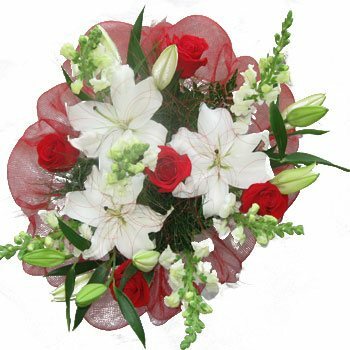 Delicate roses in deepest red are just beginning to bloom amidst eye-catching white Asiatic lilies, fronds of wildflowers, and a cloud of opaque red ribbon. Steal her heart on Valentine's Day, show him your love on an anniversary, or prepare to pop the big question with the Lady's Love Bouquet.